A combination of heating, cooling, dehumidification, ventilation and air renewal systems has been installed at the new ekinex headquarter, including a variable refrigerant volume system, a hydronic system with different types of terminals and a ventilation and air renewal system with energy recovery. Studio Associato ARTECO of Borgomanero (NO) carried out the design of the system. The system consists of one outdoor unit combined in two modules and several indoor units in different executions depending on the destination. Outdoor unit. The outdoor unit is of the direct expansion type, with inverter on compressors and fans. The technology is a variable refrigerant volume and temperature with heat recovery function. The Inverter Control constantly adjusts the volume of refrigerant used; thanks to this, the system constantly adapts to the required thermal load, avoiding unnecessary energy waste. The inverter compressors also allow precise control of the refrigerant temperature, significantly reducing operating costs. The nominal heating power reaches 69 kW, while in cooling mode it guarantees 61.5 kW. Indoor units. The indoor units are of the direct expansion type in the recessed under floor version and provide heating during winters and cooling of the rooms during summers. Thanks to the reduced depth, the units have been integrated directly into the furnishes of the different areas. The operation of the indoor units ensures very low noise levels, ideal for the working environments of the new ekinex headquarters. The result obtained is so satisfactory that the sound diffusion, integrated in the home automation system, can, in turn, be kept at low levels remaining perfectly perceivable from all points of the building. 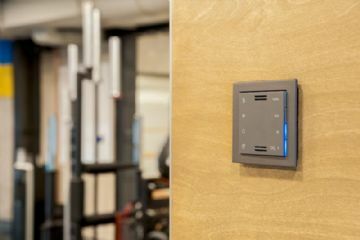 Climatic control of individual rooms or zones is possible using the FF and 71 series wall-mounted ekinex room thermostats . in the climatic cell, set up in the laboratories for testing ekinex domotic products under development, and in the CED room where mono-split kits have been installed, consisting of ductable medium head indoor ceiling units and one outdoor unit. In the case of the CED, in particular, the choice fell on a sub-system specifically designed for the cooling of infrastructures, optimised to extract the heat constantly produced by IT equipment and servers. in the archive room a dual split system has been installed, including two indoor units, of the wall split type and one outdoor unit. The interface between the ekinex KNX building automation and Daikin's dedicated communication bus system was implemented using an ekinex CoolMasterNet EK-BQ1-TP unit with an integrated KNX communication module. The hydronic system includes fan coil terminals and floor radiant panels. The former are used for summer cooling and the latter for winter heating. The terminals of the hydronic system are controlled directly by means of KNX ekinex devices. The hydraulic connection has two pipes with a two-way shut-off valve; insulated multi-layers' pipes have been installed from the manifold to the individual fan coils. To heat the offices area on the ground floor and the warehouse, a system of underfloor radiant panels was used in the version with concrete screed casting. This solution offers optimal comfort during the heating season; the central part of the ground floor has in fact a height that reaches up to the sloping roof of the building and a system based exclusively on convective heat exchange could have caused a certain stratification of the heated air. 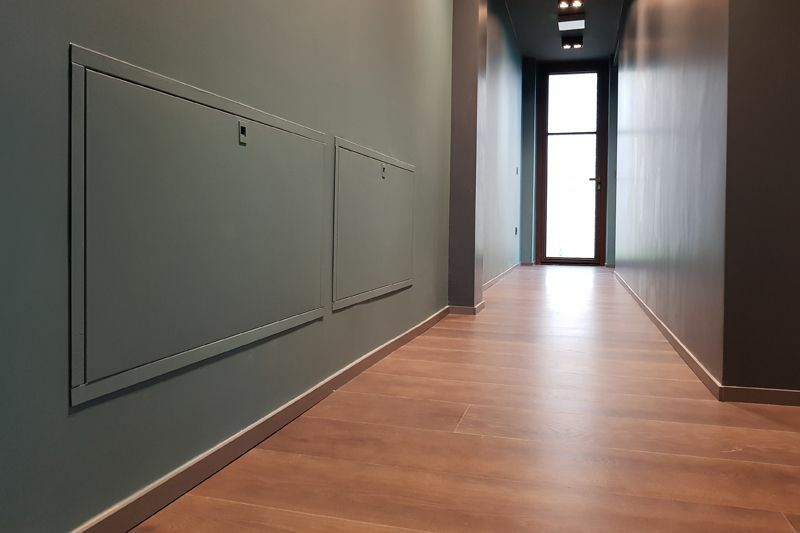 The distribution manifolds, in a box for recessed installation on the wall, have been placed in positions that do not compromise the aesthetics of the environment; the painting of the boxes in the colour adopted for the walls makes their presence always discreet and non-invasive. Ekinex EK-HE1-TP actuators have been used to control the electrothermic drives on the shut-off valves integrated in the manifolds; the air temperature regulation is made in combination with ekinex EK-EQ2-TP room thermostats (FF series) and EK-E72-TP (71 series). During the renovation of the building, all those measures that are today indispensable to achieve high energy efficiency have been adopted, such as insulation and high performance windows and doors. The resulting air impermeability of the building has made it necessary to integrate the ventilation and air renewal's function to guarantee high quality air and avoid the accumulation of microbes, allergens and humidity. Three ventilation units with cross-flow heat reclaim unit were therefore used. The units, also supplied by Daikin, are integrated in the VRV system and are equipped with a total heat exchanger (sensible heat + latent heat), air-air cross-flow, a double supply and extract fan, a filtering section and a speed regulator. In the most favourable conditions, the unit can recover up to 81% of the heat output, saving energy in the region of 40%. filtration by removing dust, pollution and odours from the air. The speed control of the fan units is carried out by means of four multi-sensors ekinex EK-ET2-TP able to detect the equivalent CO2 concentration and manage the relative thresholds. The building, built in 1945 and located in climatic zone E, has an area of about 950 m² and a gross volume of over 3,775 m³ to be heated and cooled. The quality of the technical choices and the consequent plant interventions made it possible to obtain an overall non-renewable energy performance index (EPgl,nren) of 56.28 kWh/m² per year. The value corresponds to energy class A4 - the highest currently achievable - as highlighted in the Energy Performance Certificate (APE) issued by the Piedmont Region. It should also be noted that the building has a renewable energy performance index (EPgl,ren) equal to 49.8 kWh/m² year, thanks to an annual production from renewable photovoltaic source of 17,318 kWh in standard conditions. Engineer, enthusiastic about trekking and architecture, in his spare time he has been working for years with leading technical publishers on technical books and articles. In this paper he describes the building automation system of a new headquarter, realized with an innovative and cutting-edge systems. Focus is given to the ekinex solution adopted for the thermoregulation of the rooms.